We were further intimidated by the specter of the thwarted attempts of people much more well-connected, knowledgeable, and well-funded than ourselves. One such luminary was our heroine, the late Dr. Lucy Braun, 20th century Cincinnati botanist and champion of the Great Eastern Forest. When Lucy mobilized to save one of the last old-growth forests that lay across the Ohio River in nearby Kentucky, the trees were felled despite her best efforts. Who did we think we were? From our viewpoint, we were just common everyday people who were running a small retail bakery and gift shop in a city market in downtown Columbus. On one hand we were, admittedly, decent naturalists, but weighing heavily on the other end of the scale were the facts that our financial resources were modest, we didn’t have a clue how to go about fund-raising, we were flaming introverts, and we were heavily preoccupied by our 60-plus hour work week that began at 3 am each morning. Recalling those days, it wasn’t boldness or misplaced confidence that ignited our drive. It was desperation. We were old enough to have seen the sustainability dreams of the 1960s and 70s long past dashed. Anguish over the future of our world and everything we most loved about it smoldered on the edge of our consciousness. The ache could only be kept at bay by staying fiercely busy. Furthermore, we had just returned from our first trip out of country to South and Central America. En route to the Amazon, we flew over thousands of acres of burning rainforest in Brazil. In Belize, we stood on the shore of entire bays filled with floating plastic. Yet in these same locales we tasted – for the first time in our lives – the intoxicating nectar of tropical biodiversity. An unnamed hole that had been yawning in my soul for my entire life was suddenly and astonishingly filled – filled by the whoops of howler monkeys greeting the dawn, jaguar prints padding across a pristine beach, dozens of screaming parrots flying across a setting sun, and the gentle breeze of vampire bat wings against my face at night – thankfully just on the other side of my mosquito netting! In the frenzied vortex of life that swirls in an intact tropical rainforest I was no longer a disconnected and disenfranchised observer of nature. I belonged. I left the jungle transformed. I had a name for my pain, and best of all, I now knew the remedy. Returning home, I could no longer justify the self-serving “someday-I’ll-just-escape-to-a-cabin-in-the-woods” fantasy that had previously propped my daily labors. I passionately knew I needed to dedicate my life to protecting wildlands and biodiversity. I could try to learn Spanish and live in a Volkswagen van in Costa Rica. But I would likely end up accomplishing nothing of significance (plus I’m lousy at languages and engine repair). 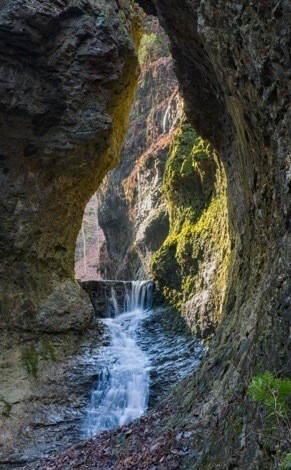 Or, I could work in my own homeland of Ohio, the very place I always dreamed of escaping. Here I knew the language, understood the natural history, and had wide and well-established social networks. Not to mention the fact that Ohio certainly needed all the help it could get! I was afire with a cause looking for a project, and it wasn’t long before a project found me. In an attempt to save the significant geological and biological features of the cave park known as 7 Caves, my husband and I founded a new non-profit called The Highlands Nature Sanctuary. The new nature preserve took its first tentative breath in the world with no acres of land to its name and no assets in the bank. Looking back through the two decades that followed; and recounting the many events, people, and synchronicities that transformed the Highlands Nature Sanctuary into the Arc of Appalachia Preserve System that it is today, I have to say those prudent early counselors were right. It shouldn’t have worked. But it did, and it worked beyond our wildest dreams! Today the Highlands Nature Sanctuary is nearly 3000 acres in size, composed of 68 separate land acquisitions. 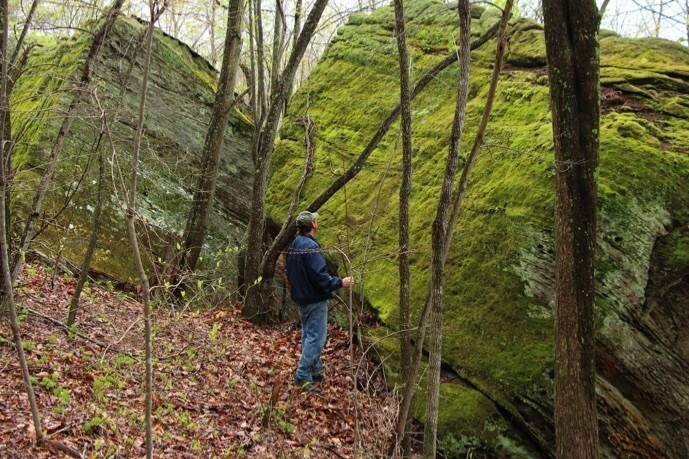 Astonishingly, the Sanctuary is now just one of 21 preserves scattered across southern Ohio. The Arc of Appalachia Preserve System, as it stands today, is over 7000 acres in size and represents 17 million in acquisition dollars. No, none of this should have worked out this way. The how and the why it did is the subject of this article, at least to the degree that the story can be told. Unexplainable are the miracles and the saved-in-the-nick-of-time dramas that consistently accompanied our evolution. There were so many of them! But what I can describe are some of the landing pads we built to receive those miracles. 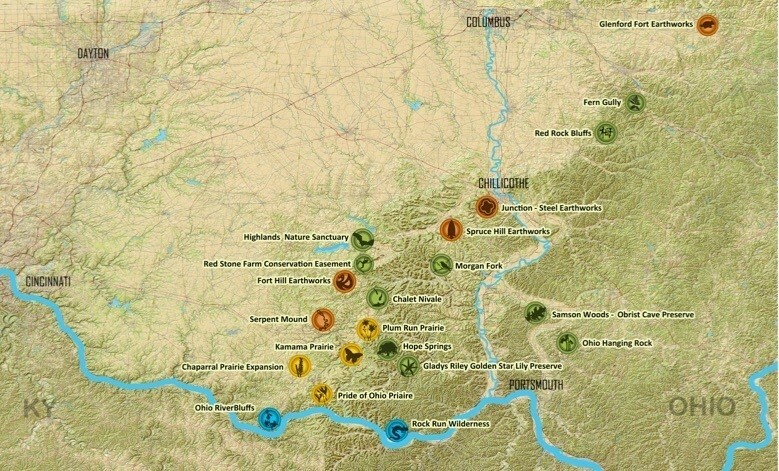 Admittedly, it’s intimidating to try to tell the story of the Arc of Appalachia in the context of so many stellar conservation projects, much larger than ours, that have taken place across the United States. Ohio doesn’t boast the mountains of Colorado, the big ranch lands of California, the estuaries of Panhandle Florida, or the vast timberlands of Maine. Ohio is one of the most populated states in the nation (7th), one of the most densely populated (10th), and THE most polluted (#1). It has one of the lowest percentages of federally-protected land (9th), and a land use that is high in both industry and agriculture. Yet, perhaps, these are the very elements that make this story worthy of being told around the campfire. Perhaps the value of this tale is the simple demonstration that: “If it can be done in Ohio, it can be done anywhere.” And anywhere and everywhere is exactly where our country’s preservation work needs to be done. Saving private land, of course, always comes down to finding the funds to do it. Here at the Arc of Appalachia, although we have been substantially aided by grants over the years, the true power of our organization lies in our private benefactors. People will save what they love. Practically speaking, this means someone has to romance the property to our far-flung donors. Here in Ohio, just like in every other state, there is much that is easy to love. The mixed mesophytic forest is a particularly rich ecoregion in the larger Eastern Deciduous Forest, occupying a narrow corridor along the western foothills of the Appalachian Mountains that begins in Alabama and moves northward into southwestern Pennsylvania. As the mixed mesophytic forest approaches Kentucky, it widens dramatically to take in most of West Virginia and a large swath of land across southern and eastern Ohio. This mixed mesophytic forest ecoregion boasts exceptional temperate terrestrial biodiversity, from songbirds to snails to salamanders, as well as extravagant freshwater aquatic diversity. Consequently, Ohio, Kentucky, and West Virginia are some of the best places in the world to preserve the Temperate Deciduous Forest Biome, considered by ecologists to be one of the most disturbed of Earth’s biomes and therefore deeply worthy of protection. Ohio has significant physiographic features, including Lake Erie to the north and the beautiful Ohio River to the south. In the northwest corner of the state are the remnants of the Great Black Swamp. 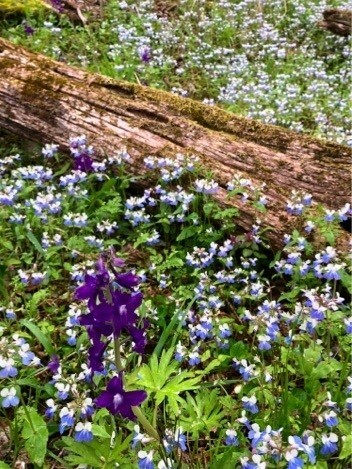 The karst landscapes of southwestern Ohio boast some of the most spectacular wildflower displays in all of Eastern United States. Also in the southwest quadrant are rare, unglaciated, eastern prairie ecosystems that shelter dozens of endangered and threatened wildflowers. The most dissected of Ohio’s Appalachian foothills – known as the Little Smokies of Ohio – are located in southcentral Ohio. Some of Ohio’s most spectacular rock shelters, cliffs and recess caves can be found in the Hocking Hills region of southeastern Ohio. Our work acknowledges that Ohio IS beautiful. Here at the Arc, our staff and board members fall in love with every parcel we hope to buy before we craft our public campaign, risking the heartbreak of failure in the process, but infusing our campaign with passion, enthusiasm and commitment. Junction earthworks (c) Tim Anderson Jr.
No culture recognized the significance of Ohio’s rich flora and fauna better than the Hopewell Culture that occupied the region 2000 years ago. These American Indians built massive earthwork and mound complexes almost exclusively in southern Ohio – 36 complex monuments in total. Some were so large they could be measured in square miles; several were astronomically aligned with major celestial events. The great earthen walls and mounds engineered by the Hopewell Culture – along with ceremonial art that captured the spiritual essence of Ohio’s native animals – represent Ohio’s greatest cultural florescence ever. The Arc of Appalachia has played a pivotal role in buying and saving four of these great earthen complexes – deliberately embedding them within protected natural areas. We have found that fund-raising projects involving both natural and historical preservation have been the most compelling campaigns in our entire history. No two fund-raising drives have been more successful, nor heady, than our last minute campaigns to buy Junction Earthworks and Spruce Hill Earthworks off the auction block. If we are to undertake the task of nature preservation, here at the Arc we believe it is essential to honor the people who cared for the land long before we did. If it were a cookie-cutter process to raise money for a good cause, all non-profits would be well funded. Fortuitously, we decided early on that if we were to succeed in fund-raising, we had to take the path less traveled. Perhaps of greatest importance is what we decided NOT to do. We didn’t print t-shirts, send out multiple mailings a year, nor issue credit cards. We didn’t sell calendars, tote bags or ball caps. We didn’t sell bricks with donors’ names on them, nor print the names of our benefactors in our annual news magazine. We didn’t host silent auctions or high-ticket dinners. We’ve never phoned donors to ask for a donation. We’ve never used guilt or anxiety to solicit a donation, nor have we manufactured preservation crises that don’t really exist. We don’t sell or buy mailing lists. We wouldn’t think of doing background checks on our donors’ finances. We don’t concoct cleverly named giving levels and then urge donors to climb to the next highest level with each passing year. We think every committed Arc employee and every board member performing his or her role with excellence is the best fundraising strategy ever. In summary, we treat our donors like the brilliant, worldly, and sophisticated people they are. We believe the best strategy to serve our donors is to perform our mission prudently, creatively and efficiently. We ask our donors to support the Arc of Appalachia with just one donation a year. The space on the donation form asking donors for the amount they wish to give is a blank line. Even though only a very small minority of people in Ohio love nature enough to volunteer or write a check for land preservation, those who do are actively seeking out effective nonprofits to accomplish their most heartfelt goals. Once they gain trust in an organization, we have found they give with astonishing self-sacrifice and generosity. Here at the Arc, we are blessed to work with some of the finest, most enlightened and passionate people on the planet. We believe non-profits are like any other natural community. Our health and sustainability depend on the quality and diversity of our relationships. And so, we invest in our own species. We bank on the premise that our human capacity to destroy is surpassed only by our capacity to love and regenerate. We practice nonjudgement. We look for magic in every new person we meet. Greeting each new acquaintance, we ask, “Who are you, and what new creative endeavor might we do together?” A non-profit is never short on money – only people. We trust in people’s inscrutable impulses to work in collaboration, even when they are living miles apart and are completely unknown to each other. Just as distantly spaced trees are connected and nourished by an invisible network of mycelium, our many miracles have demonstrated that people of good will are invisibly connected by forces more mysterious and powerful than we will ever know. Perhaps the Arc of Appalachia’s greatest quality is the extent to which our staff, donors, board members, and volunteers feel like one big family. Like any healthy family, connection relies on good communication, which is accomplished through the usual social network venues, a large and festive annual gathering, and the yearly publishing of a plump, full-color magazine. The news magazine is perhaps the most important thing we do to drive our organization forward. This yearly publication unleashes the full power of story – relaying vivid, personal accounts of our campaign properties. In the storytelling process we impart to our readers a deep knowledge of the lands we are trying to buy – their natural history, beauty, regional significance, and singularity – accompanied with detailed maps. Through these essays our donors become nearly as deeply informed about our land projects as are staff and board members. When donors become this knowledgeable, the quality of the ideas they contribute to our organization is astonishing. Together our board, volunteers, staff, and donors become a tightly knit, unified team. 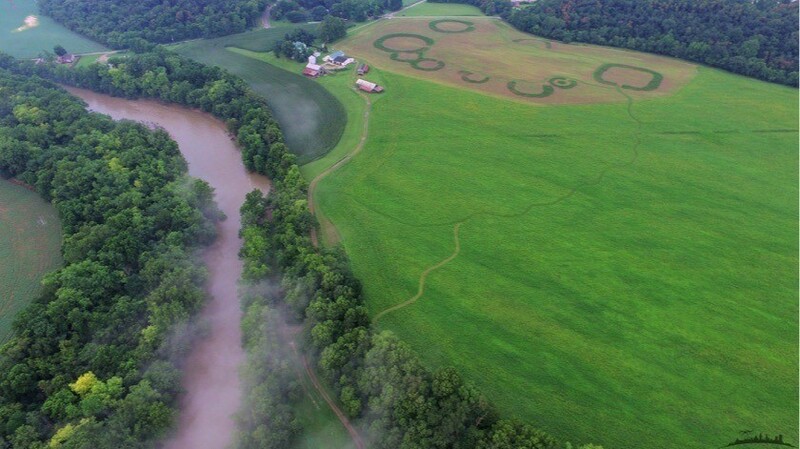 Just as the Arc of Appalachia’s land stewardship practices are based on science, and our financial management on sound accounting principles, our land preservation efforts rest on ethics and compassion. Thus our annual magazine not only addresses the rational mind, but speaks to the heart – communicating through the creative works of photographers, painters, and poets. With the help of these artists, our magazine is not just informative, but stunningly beautiful and uplifting. Our fraternization doesn’t stop with the news magazine. Each year the Arc offers residency to a number of artists in our overnight facilities, and hosts several creative art & nature collaborations. The Arc of Appalachia is opportunistic and responsive. Our special nonprofit niche is our ability to respond quickly to land acquisition emergencies. Our board has the ability to communicate rapidly and pass a resolution in 24-48 hours when pressed to do so. And, although we have land-buying priorities and three-year strategic plans, we perceive them as guides – not walls. We can completely veer off our best laid plans whenever an unexpected but compelling opportunity presents itself. The 21 nature preserves that the Arc of Appalachia has acquired and assembled over the years are exceptionally beautiful and biodiverse. Most of them were unplanned. Collectively they are grander than any rational plan we could have ever crafted. A person who only takes and never gives back will eventually exhaust and repel his or her colleagues and friends. Similarly, it behooves a nonprofit to not only focus on serving its inner community of volunteers and donors, but to give back to the larger world with services the larger world values. To this purpose the Arc of Appalachia dedicates substantial resources to the management of over 40 miles of hiking trails, guided hikes, special events, and three educational museums – all of which are free to the public. Also offered to the public are cabin and group lodge rentals, guided retreats, and intensive nature education courses. Why do some of us love biodiversity so much and why is it worth saving? Not everyone loves Life in all of its magical multiplicity. Those who deeply cherish Life in all its forms have a special sensitivity to the tension that exists between separateness and unity. On one hand we celebrate biodiversity, on the other, the Oneness of all Life. Parents love a newborn baby because they feel the child is an extension of themselves. We love the sandhill crane and the spotted salamander for the same reason. When we find a piece of ourselves in every living thing, we naturally want to protect every holy embodiment of Life, in all of its splendid diversity. Buying back the land to preserve biodiversity is heady stuff. With every acre saved, there will be more tree frogs chanting in June, more wood thrush filling the valleys with flute music, more crickets and katydids turning leaves into late summer song, more wildflowers to grace our earth. Chances are, life on Earth is not like the Titanic, either sailing or sinking. It is more like floating in an ocean on a life raft that keeps crumbling away at its edges, losing species with every roll of the wave. Here at the Arc it pleases us no end to help make that raft as large and complex, as strong and biodiverse, as beautiful and inclusive, as our hands, hearts, and dollars can accomplish. For more information, or to support the Arc of Appalachia, please see our website at www.arcofappalachia where you will see a listing of our current land acquisition projects. At the time of this writing (February, 2019), we are working on adding another 940 acres of natural areas to the Arc of Appalachia Preserve System. If you are ever in Ohio, don’t hesitate to stop by and see us. Nancy Stranahan serves as the Director of the Arc of Appalachia Preserve System, and was one of the non-profit’s founders in 1995. In the span of directing the organization over the last 20-plus years, Nancy has cultivated a vigorous citizen advocacy network in Ohio, what Nancy like to refer to as a tree-roots network. 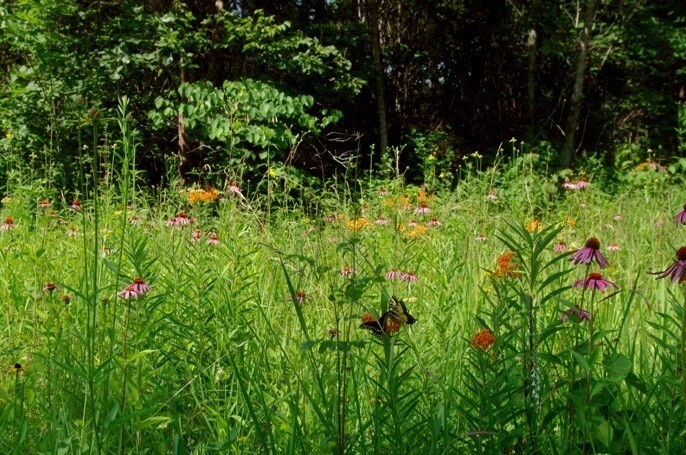 The Arc has saved and preserved over 7000 acres of natural areas in Appalachian Ohio, representing 21 preserve regions and over 100 separate real estate negotiations and fund-raising campaigns. The Arc’s headquarters, the 3000-acre Highlands Nature Sanctuary, is the Arc’s largest and oldest preserve region, and is the hub of the Arc’s primary visitor services, offering over 16 miles of public hiking trails, overnight lodges, and an interpretive Museum. 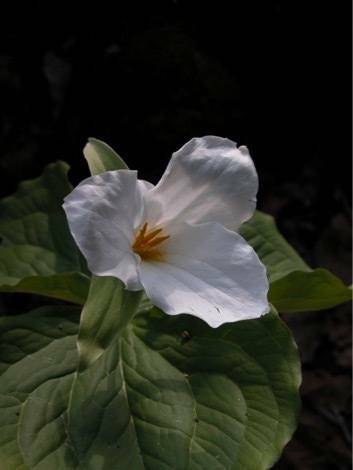 A few of the many rare and common signature species protected within the Arc suite of nature preserves are Henslow sparrows, cerulean warblers, golden star lilies, northern long-eared bats and timber rattlesnakes. Under Nancy’s guidance, the Arc has also been instrumental in saving several 2000-year old Native American earthwork complexes, notably Spruce Hill, Glenford Fort, Junction, and Steel Earthwork sites. In addition, the Arc manages two long-protected earthwork sites – Fort Hill and Serpent Mound – working as a contract manager for the Ohio History Connection. Previously in her career Nancy served as Chief Naturalist for Ohio State Parks with the Ohio Dept. of Natural Resources; and operated Benevolence Café and Bakery in downtown Columbus’ city market for 20 years, where she promoted healthy and intentional food choices. Nancy, I have admired you since 1980. reading your writing is a special delight. Anyone who cherishes the chance to observe ancient ephemeral displays, immerse herself in glorious prairie effulgence, walk amidst the cathedrals of old growth Eastern forest trees, and stand in awe of prehistoric human earthworks, thanks you for you efforts. I am so glad I have reconnected with you and with beauty of southern Ohio. Thanks for giving me the opportunity to be a small part of the unique wonder of Arc of Appalachia. This was a particularly uplifting article – full of heart, full of wisdom. I’ll share with members of my board as insightful and provocative guidance in how to get conservation done. Thank you so much Nancy for sharing your story, I had not heard of it before, but I will definitely share it with my circle here in NM. Nancy as I have always said, “you and the Arc have always been one of my best and favorite rocks”, even though we have met much too few times.